February 2019 volunteers in the spotlight: The Bell family. Rita, Teule Sr., Teule Jr. and Amara Bell, with Dotty Mora, represent three generations of a family who volunteer with Fresno Filmworks. 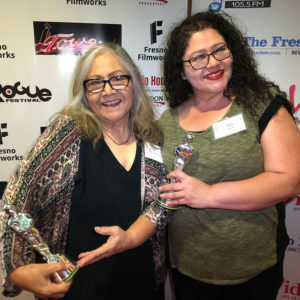 Rita, who serves as Fresno Filmworks’ vice president and box office coordinator, has volunteered since 2014. Volunteering with Filmworks seems to be a family affair for you and your husband Teule, your kids Teule Jr. and Amara, and mom Dotty Mora. How did this come about—did you volunteer and then your family followed? Rita: The short answer is yes. In 2013, with my kids getting older, I began looking for volunteer opportunities. I grew up seeing my mom volunteering with a variety of organizations, so it was a natural thing to do. 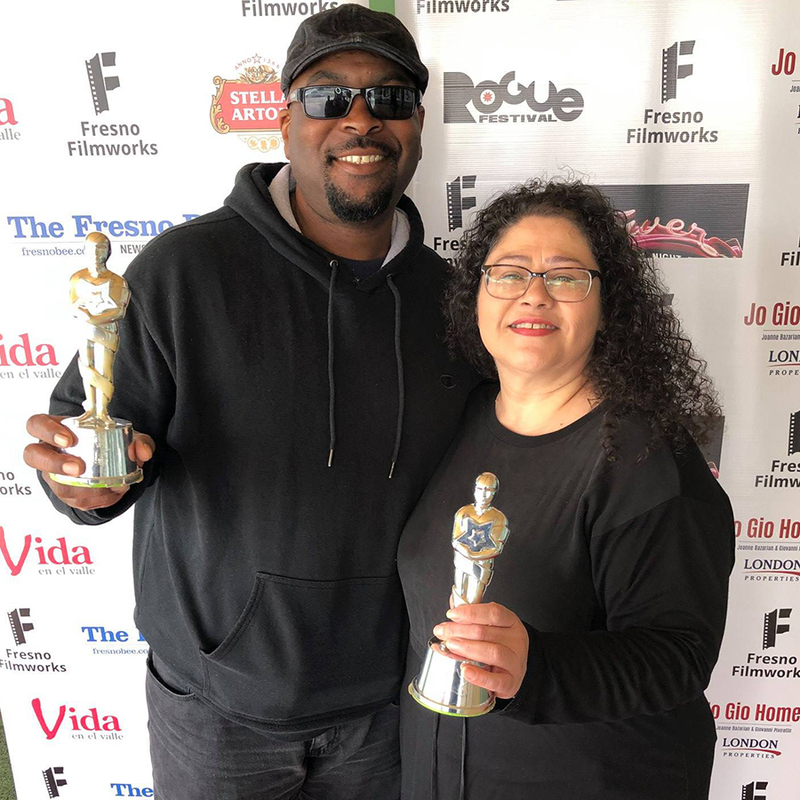 I’d attended a couple of Fresno Filmworks films over the years and happened to meet Gloria Burrola, a longtime former board member, at another organization’s volunteer orientation. I began volunteering at Filmworks’ monthly screenings and later joined the board in 2015. As my responsibilities with Filmworks increased, first as venue director and now as VP, my family began volunteering as well. Does your family enjoy watching films together? Does anyone have a preferred genre, and do you take turns choosing movies to watch? Rita: Watching movies was always a family affair, but as we’ve all gotten older and the kids do things with their friends, our tastes have grown and outgrown each other. We still watch superhero movies together: all of the Marvel and DC franchise films. Let’s learn a little bit about your family members and yourself. What are your occupations here in Fresno? Rita: I am an intellectual property paralegal with Dowling Aaron Incorporated, working mostly on trademark matters. Teule Sr. is a security officer with Foster Farms. The kids are all still students. Our oldest daughter attends Fresno City College full-time and works part-time at Starbucks. Teule Jr. attends Fresno City College part-time and works for the California Conservation Corps. Amara is in her junior year at Fresno High School. Mom (Dotty Mora) is retired now. What are some of your hobbies and other volunteer activities? Rita: I also volunteer on the board of the Fresno Center for Nonviolence and the organizing committee for Earth Day Fresno—which is coming up on April 20! My husband and son say their hobbies are supporting my volunteer efforts by doing all the heavy lifting and setup at various events. Amara and I have recently started crafting together, starting with handmade cards. It’s relaxing and neither of us is creative so it’s a new outlet for us. This year, Amara is taking film classes in school, which is fast becoming a new hobby for her. Why is it important to you to support Filmworks? Rita: Films are art, which is important in any community. Independent films don’t come with the trappings of big studio predictable story lines and all the bells and whistles. They also don’t get the big dollars of the big studios. So when organizations like Filmworks bring independent films to Fresno, we are helping someone somewhere accomplish their dream. What originally led to your interests in movies? What are your favorite films you’ve seen at Filmworks? Rita: The animated film “Ernest & Celestine” remains my favorite Filmworks offering because our entire family attended together and loved it. What would you say to others in the community to get them interested in supporting Filmworks? Rita: I would say come out to a monthly screening on the second Friday of the month where you will see community members working together to show a film at the beautiful Tower Theatre. You can watch movies almost anywhere and anytime: on your phone or laptop, on your home big screen, or the multiplex, but you can’t get the experience of a Filmworks specialty drink or a photo on the red carpet before sitting down to watch an indie that you can’t find anywhere else in town. Also, many people probably aren’t aware that we work with local high schools and colleges on special filmmaking projects, and we invite them to attend screenings for free as part of our community giving project. Filmworks supporters, in turn, support these efforts for underserved groups. Filmworks thanks its February 2019 volunteers: Cleo Bauer, Gloria Burrola, John Dunning, Natalee Flores, Soledad Gonzalez Mora, Judy Haber, Linda Halk, Karen Hammer, Rebecca Horwitz, Neal Howard, Kathryn Johnsen, Julio Lopez, Richard Markley, Monica Marks, Ann McGowan, Conde McGowan, Donna Mott, Steven Ohanesian, Luis Ojeda, Dominic Papagni, Gene Richards, Rachael Stubbert, Lorraine Tomerlin. Filmworks thanks its January 2019 volunteers: Amara Bell, Teule Bell Sr., Nené Casares, Linda Garcia, Soledad Gonzalez Mora, Judy Haber, Linda Hernandez, Rebecca Horwitz, Carl Johnsen, Kathryn Johnsen, Justin Johnson, Ann McGowan, Conde McGowan, Donna Mott, Steve Ohanesian, Rachael Stubbert. To meet our past volunteers in the spotlight and to find out how you can volunteer with Filmworks, visit our volunteer page.